T-Mobile just made another addition to their 4G tablet portfolio with the official announcement of the T-Mobile Springboard with Google and Samsung Galaxy Tab 10.1. We’ve already heard the official announcement of the Galaxy Tab 10.1 but up until this point the T-Mobile Springboard with Google has flown under the radar. The T-Mobile Springboard with Google which we presented earlier this morning will be one of T-Mobile’s most affordable tablets. The Springboard features a 7″ HD display, 1.2GHz dual-core processor, SD card slot for up to 32GB of expandable memory, Adobe Flash, 5 megapixel rear camera, 1.3 megapixel front facing camera and 720p video recording. The Samsung Galaxy Tab 10.1 comes 4G ready in a 1.2 package featuring a 10.1″ HD display along with a Tegra 2 processor, Adobe Flash support along with pre-installed apps such as T-Mobile TV, Samsung Media Hub, Asphalt 6, Sim City Deluxe Demo, Zinio and more. Both tablets are set to launch sometime this holiday season as is typical T-Mobile fashion to tease with open timeframes for launch. Still, the Springboard should come in right around that $199.99 price we first discovered a while back making it the perfect stocking stuffer for the holidays. 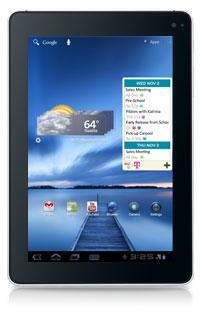 BELLEVUE, Wash. — Oct. 10, 2011 — T-Mobile USA, Inc. today unveiled two new 4G*Android™ 3.2 (Honeycomb) tablets, enhancing its growing tablet business and portfolio of high-speed mobile broadband devices. The T-Mobile® SpringBoard™ with Google™ and Samsung Galaxy Tab™ 10.1 will enable customers to enjoy their home Web and entertainment experiences virtually anywhere. The 4G-enabled T-Mobile SpringBoard is one of T-Mobile’s most affordable tablets, offering a premium mobile entertainment and rich Web experience that won’t break the bank. Featuring a stunning 7-inch HD multi-touch display, the ultra-portable T-Mobile SpringBoard can fit comfortably into a coat pocket, briefcase or purse, making it easy to carry with you while running errands, hopping on an airplane or waiting at the doctor’s office. Manufactured by Huawei, the T-Mobile SpringBoard is powered by a 1.2 GHz dual-core mobile processor and offers a variety of preloaded entertainment applications, including access to thousands of movies and TV shows via BLOCKBUSTER on Demand®, Netflix® and T-Mobile TV. The SpringBoard also offers high-speed Web browsing with support for Adobe® Flash® Player, as well as access to services and applications including Blio®eReader, MobileLife® Family Organizer powered by Cozi, Slacker Radio and TeleNav GPS Navigator™, a personal GPS navigation and local search application that provides turn-by-turn voice and on-screen driving directions. Yes finally a tab thats resonable!!! If the 10.1 Tab is less than $500, then it’s mine. It would be nice to offer versions that don’t require the cellular network. I recently became amazed at watching netflix on my phone while in bed. It would be nice to have a tablet but I don’t want to end up paying another 30 dollars a month for data service on it. My home wifi offers a stronger and constant signal compared to TMOs network and I won’t have to worry about a data cap if I’m streaming video. Yes there are wifi versions of tablets but I didn’t see the article mention wifi only versions of these two products. the samsung 10.1 tablet WiFi-only version has been available for quite some time from other vendors, but the pricing is ridiculous @ around $700. 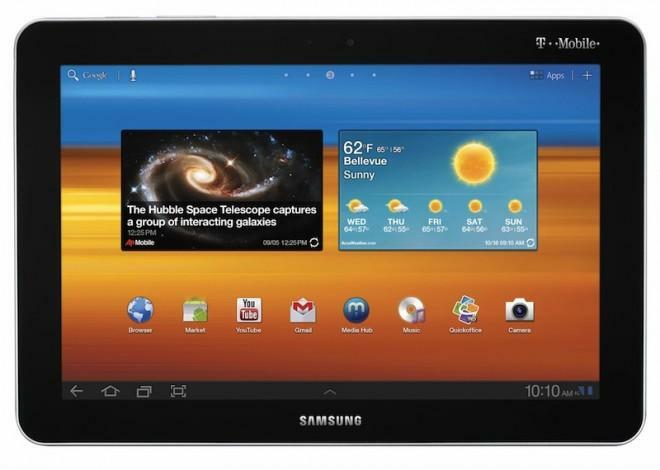 The question is: does the Galaxy Tab 10.1 support 42mbps HSPA+? If it does, I’ll get it. I’ve been waiting for a 10″+ tablet.